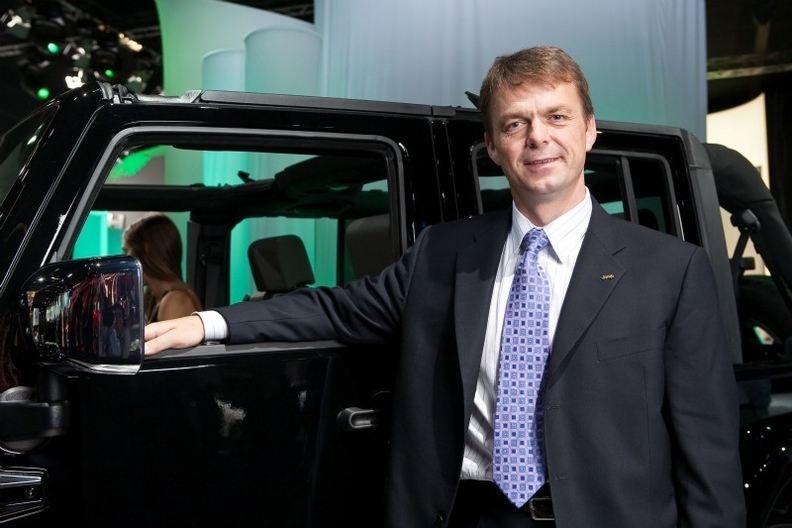 BALOCCO, Italy – Chrysler Group's Jeep brand aims to boost unit sales in Europe - its biggest export market - to 125,000 by 2014 from 25,000 forecast this year, CEO Mike Manley said. Fiat-Chrysler CEO Sergio Marchionne wants to increase Jeep's global sales to more than 800,000 units in 2014 from 420,000 last year, so success in Europe will be a key element. "Our plans for Europe are ambitious but doable," Manley told Automotive News Europe. "Europe for Jeep is an incredibly important market. We have been here for 30 years and half of our international sales historically were in Europe," he said. New products, including the brand's first small SUV and a new expanded dealer network will help Jeep to reach the goal, Manley said at a press event here on April 15. Jeep will launch three fuel-efficient SUVs that will help boost sales in European countries that have emission-based car taxes. Jeep's first small SUV -- a Fiat-based "baby" Wrangler code-named B-SUV that likely will be built in Toluca, Mexico for sale in Europe, North America and Latin America, starting in late 2013 or early 2014. A replacement for the Cherokee medium SUV (called the Liberty in the U.S.) that will go into production in the U.S. in early 2013 and will be exported to Europe by spring 2013. Code-named D-SUV, the model will remain an all-wheel-drive vehicle only, with a front-wheel-drive option possible, but not planned at the moment. For Europe, a key engine will be Fiat's 170-hp, 2.0-liter, four-cylinder gasoline engine. Jeep will benefit from a revamped version of the Fiat engine, which - by using Fiat's MultiAir variable valve timing system – will have increased power and torque, while lowering fuel consumption and emissions. Jeep dropped the fuel-hungry Cherokee from its European lineup, but sells the Grand Cherokee large SUV with a 241-hp 3.0-liter V-6 diesel engine from VM Motori of Italy. A single SUV to replace the Compass/Patriot compact models. It will debut in Europe in mid-2013 and will be built for global markets, including North America, at Fiat's Italian plant in Mirafiori. Code-named C-SUV, this model will share many components and systems with the Alfa Romeo C-SUV that will be built in Mirafiori by the end of 2012. The C-SUV will be offered with awd and fwd, Manley said. In Europe, the Jeep Wrangler now offers a fuel-saving stop-start system for the first time on a Jeep vehicle. The system, coupled with VM Motori's 200-hp 2.8-liter 4-cylinder diesel engine and manual transmission, cuts fuel consumption by 13 percent to 7.1 liters/100km and emissions by 14 percent to 187g/km. By June 1, Jeep will have 430 dealers across Europe, roughly 75 percent of which were part of the original 450-dealer network that Fiat inherited from Chrysler Europe when Fiat was appointed European distributor for all Chrysler Group brands last September. The 25 percent of dealers new to Jeep come from Fiat, mainly from the Lancia brand. Jeep aims to have 650 dealers in Europe by 2014. The brand expects to benefit from rising SUV sales in Europe. It expects European sales of SUVs to grow to 1.2 million in 2014 from from 800,000 units last year. Jeep sales in Europe reached 48,000 in 2007 and progressively declined to a recent low of 15,000 units last year. Sales were hit because of an aging product lineup and the financial troubles of parent Chrysler, which in February 2009 filed for bankruptcy protection.